Pat K ane on the crippling irony of England’s Dreaming. Such a strange spectacle yesterday. As May invoked “sovereignty”, “national self-determination”, “negotiating positions”, I wondered how Salmond felt listening to this. A Scottish indy in 2014 would have had to deploy the same blend of abstract principle and gamesmanship. So, to some extent, the underlying mechanics of the nation state (formed, forming or deforming) on display. Yet the jaw stayed dropped, as the exceptionalism of a “Global Britain” hovered behind her lectern. “Global” meaning “Used-To-Be-Imperial-Still-Got-It”. 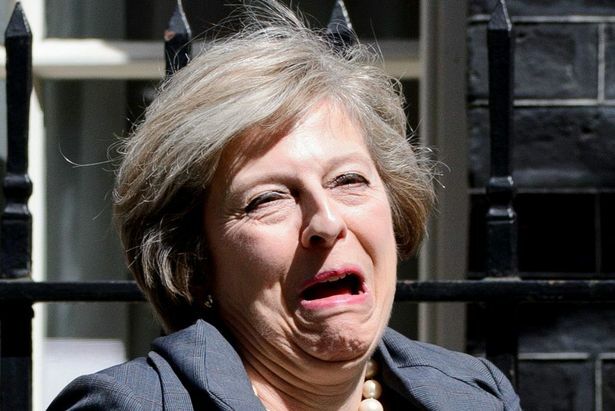 As May buccaneered through her speech, I was wincing at the amount of “global” reality that’s about to bite. Will the massive, rising economic zones of South America, South-East Asia, China, India give a rice grain for a “Global Britain”, opening up their coat to show their wares, like the spiv in St. Trinians? Or might they respond, “we’d rather deal with 500 million, singly-regulated producers and consumers, please”? Jings. Sigh. Remember when the merest hint of steel over our post-Yes debt obligation in 2014 heralded the End Of Days? In another tweet, David Greig worried that Scots were facing the worst of all worlds – a hard Brexit and a hard Indy. My reply was that surely any indy pitch that’s about a “remain and reform” attitude to the EU, is always a ”soft” #indy – we are the willing partner in their toughest times? And to be honest, some “hard” Indy is necessary – eg Trident, currency, dealing with assets/debt, etc. Indeed, the quanta of “hardness” in our lives is strong and wide at the moment – Ben Wray’s excellent piece on indy’s more global challenges shows this well. Scotland showing thoughtful governance, and civic self-awareness, in this moment of crisis, is capital of some kind in the bank of Indy. Lastly, from May’s speech: Scotland is about to enter into adult-level realpolitik here, as May shouts “Singapore!” at the Eurocrats. For the latter, a clear Scottish declaration of #IndyInEU could be a way to temper the rapacious, aggressive Freezone that’s metastasizing off their shores. All fun and games, until someone – and we know who – comes to terms with their eye-dentity. We can either brick ourselves in, as the elites cavort and dismay. Or: we build. If you want to support Bella for as little as £5 a month – go here – Thank You. I don’t really see Global May as the spiv from St Trinian’s; what could she have possibly inside her coat to entice potential customers? I see her more like Margaret Rutherford in ‘Passport to Pimlico’ or Peter Sellars as the Duchess in ‘The Mouse that Roared’. My neighbour has a little miniature Pomeranian who runs around barking and roaring at Alsatians and Dobermans. The Pom thinks she’s scaring them. She isn’t. She’s called Theresa. Worth a read, especially in relation to the end comment above about coming to terms with identity issues: The problem with the English: England doesn’t want to be just another member of a team. Link above doesn’t appear to work. Try this: England doesn’t want to be just another member of a team. Or if that fails, it’s a piece by Nicholas Boyle that can be found in The New European. Easy to criticise the Brexiteers and Little Englanders. If Scotland as a whole displayed that sort of blind chauvinism for a single day, though, all our problems would be over. We should be wishing more of us were like them rather than scorning them. And we should be asking why so many in Scotland are so negative and muted about our great country whilst the English remain so upbeat about theirs. It’s perplexing. Probably understandable that our hefty neighbour would divide, confuse, and rule us like this. But when will the fools here see that when they say Britain they really mean England? Everything for Britian. Great, Global Britian.